Bamboo Stool is an artifact decorative item. Location where the bamboo stool can be found. 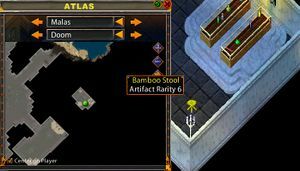 Bamboo Stools can be acquired in the dungeon Doom in Malas. It has a rarity of 6 and therefore spawns approximately every 2 days. A minimum of 100 (Grand Master) stealing skill is required. (110° 2'N 58° 0'W) Located near Nix the Variety Dealer in a hidden room in the gauntlet section of the dungeon. The spawn location varies by a few tiles each time. Bamboo Stools give 200 Clean Up Britannia (2011) points. This page was last modified on 29 May 2012.